The Monster Food! - OMG Parenting!OMG Parenting! ← Video Games and the Brain – good or bad? The monster food – sugar. It makes us happy. It makes us sad. And it certainly makes us confused! There are so many kinds of sugar, I stopped counting! Table, brown, cane, molasses, honey, syrup, fructose, maltose, dextrose, corn syrup….Parents rightfully wonder, what is the deal with sugar! So I am going to break down the FIVE things you need to know so you can manage sugar healthily. Well, the problem is, we haven’t been complex enough about it! What I mean is, sugar comes in both simple and complex forms. They are both a carbohydrate. And we need more of the complex sugars/carbohydrates. But we get too many of the simple kind. When we say simple sugar, we are speaking of the sugar on a label called ‘sugar’. It is the amount of sugar in the product that has few vitamins and minerals (hence the phrase ’empty calories’), and it is so easy for the body to digest that it spikes your blood sugar. Seems like easy digestion should be a good thing, but not in this case. This makes other parts of your body work really hard to stay in balance – insulin, your brain. Because, you see, your body simply can’t take too much sugar at one time. Kinda like your body can only take a certain heart rate at one time. When we say complex sugar/carbohydrate, the one we aren’t having enough of, we are referring to the part of a label called ‘carbohydrates’. These sugars are a natural part of the food that has minerals, vitamins, and even fiber. These carbohydrates are the favored in terms of balancing our energy system. Even within this group there is a subgroup you will hear people talking about; low glycemic index foods and high glycemic index foods (lo glycemic are considered the ones that assure we aren’t getting too much sugar at once). We’re not going to go there now but I just wanted to mention that in case you hear it out there. So how did simple sugar get to be such a complex health focus? Because as food processing has changed, also changing is the simple sugar content of food. Simple sugars have exploded. We have much more bleached, processed, refined and enriched foods out there. The vitamins and minerals have been removed. The sugar is simpler. So beyond table sugar, the sugar we use for cooking, baking, on grapefruit, cereal, tea, coffee…has simple sugar. Plus, and this is big, our everyday food and drinks have simple sugar in it. It is that kind of food that our kids perpetually snack on, not to mention eat for meals. The effect of processed food on added sugar/day is enormous – see below in the section What’s the Right Amount of Sugar? With the pleasure of predicted rewards, a type of dopamine is stimulated in certain parts of our brain (there is more than one type and their pathways are multiple) Dopamine is a highly complex neurotransmitter system – it is part of our reward system that scientists are just starting to understand. And it does different things in different parts of the brain, then sends signals back to the body. Mind body connection, folks. (A little aside, as I research some of these topics I am in awe of our bodies. We really should take care of them – they are doing a helluva job trying to keep up with us). So when we have sugar and feel rewarded, a few times later when we even see the sugary food, the pleasure is anticipated and a part of our dopamine system gets going. Then, at the risk of oversimplifying it, if we have sugar frequently throughout the day, this part of the dopamine system never gets to rest; it never gets to come back to baseline. So we need more and more of the sugar to get the pleasure feeling we want when we eat sugar. After a while, at the mere suggestion or desire for something sugary, our dopamine gets going and says, give me pleasure. And round and round it goes; we want more, we give our bodies more, we need more to keep the dopamine going so we feel pleasure. In extreme situations, this leads to addiction. Even without being sugar addicted, this connection between body and brain is part of what makes it so hard to reduce our sugar. Where’s our pleasure, we scream! If you get nothing else out of this, when you stop reading I hope you at least get that when you change your kids sugar habits, they may be rebellious for a while! It’s time then to remember, they just want reward. So find other rewards that mean A LOT OF PLEASURE to them. Hugs, attention, getting together with friends, a video game played together, dance a bit, out to look at clothes but not buy? After you watch, RETURN TO READING HERE! A 12 oz. can of coke has 140 calories of added sugar. A regular size snickers bar has 120 calories of added sugar. 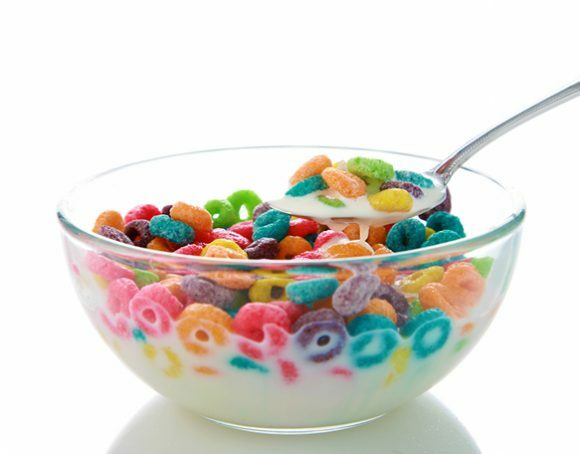 A bowl of dry cereal has 4 teaspoons of sugar on average. We keep talking calories and teaspoons when sugar on food labels is usually identified in gms (grams). So for your math challenge, you get to convert it to calories knowing that 1 gm of sugar = 3.87 calories. For instance, if there are 9 gms of sugar on the label, 3.87 x 9 = 34.83 calories. If you don’t like doing the math, try the Traffic Light Food Tracker. It will give you a traffic light color – red, green, yellow – for the health of the sugar, fat, and salt content in your food. Cool! Or, for those of you who aren’t app oriented, check out this website, http://dietgrail.com/sugars/. It is an incredibly comprehensive listing of foods and their sugar content. You can compare cereal brands before shopping! Sensitivity to sugars is present in close to 30% of the population, some say. It’s called a sugar intolerance. I include it here because it can be the cause of mood swings, fatigue, diahrrea, and other unpleasant symptons. It will frequently be missed as a diagnosis for your sons or daughters symptons so you have to be your own advocate. The most common kind of sensitivity known is fructose malabsorption – epithelial cells on the surface of the intesting are not available to break down the fructose sugars. Fructose is one of those simple sugars. According to the University of Virginia’s Digestive Health Center, it’s found in fruits and honey, and also syrups and many sweetened foods and beverages. There’s also a growing number of reports about sensitivities to sugar free sweeteners; aspartame (NutraSweet, equal, sugar twin), saccharin (sweet’n low, sweet twin, nectar sweet), rebiana (truvia), and sucralose (splenda) Excessive consumption of artificial sweeteners can cause diarrhea. The only one that has not been put into this category is stevia. However, as Dietician – Cassie told me, no long term studies have been done on stevia yet, so use it wisely (i.e. moderately). But for now, it remains the plant that sweetens without increasing our blood sugars – yeah! Or adding calories – double yeah! In the end, if you are challenged by your childs moods, energy, and digestive responses, you might want to pursue this whole area of sugar sensitivity. While this is not an allergy, as a smart allergist told me one day, my daughter might have food sensitivities. And, he went on to explain, if she is eating enough of what she is sensitive to, the body reaches a tipping point and the sensitivity can start to act like an allergy. start by looking at where your child is getting the most sugar; processed foods (cereals, breads, baked goods, frozen dinners), sweet snacks, soft and sports drinks and juices? eliminate the biggest category first – this can be a big change so plan ahead for some fun food and activity replacements, and help in the kitchen! keep going – this can be a little rigorous. The Mayo Clinic also recommends avoiding powdered or confectioner’s sugar, all types of flavored waters and any type of sweetened milk, including coconut milk. So if these are the big sugar inputs in your kids, take a good month to go without them. Track the changes. Sometimes you can start to reintroduce them but at lesser amounts than before. Or, you might find that your child simply needs to stay without them. Read up on it, consult a good nutritionist, and be ready for a journey. In the good old days of yore, nobody needed to pay attention to sugar the way we do now. Since it is now an official parenting responsibility to be aware of this dietary demon, here are some ideas for simplifying this task. Before I go into them, let me just say that you are off the hook in terms of having to be immediately perfect with this; just go for general downward trends of added sugar in your home. Read labels. Look at the GMs of sugar (not carbohydrates) to help balance out the days food. You have less control with school lunches but pay attention to the foods eaten in your home. Commit to what you want to cut back on and find the replacements you like. Stay with this for awhile. Then cut back on something else. Plan that it will take a little longer in the grocery store. After you have done this a few times it will actually get easier. It is a bit of a pain in the neck at first unless you like this level of detail! If you have a child that loves detail, and loves doing math, involve them! In general, shop the outside aisles of the grocery store more than the inside aisles; you’ll find less of the added sugars/refined sugars/artificial sugars. Most importantly, find the rewards that are healthy and help your child feel truly rewarded. Ask them what makes them feel like they got a reward outside of the sugar demon. And write to me about it in the reply section. This is a very important part of parenting healthily! The more we parents require healthy food, the more healthy food will be made available. Shop those farmers markets! If you aren’t already, we’d love to see you in the OMGparenting community – sign up for the e-notes! It’s brief (I know you are busy). You’ll say ‘oh that’s why’, or ‘oh, I’m not alone’ to the fun facts. And you’ll get inside information on what’s newly posted so you won’t miss out on anything important to you.